"Lincoln Park District showing present park area proposed extensions and work under construction." 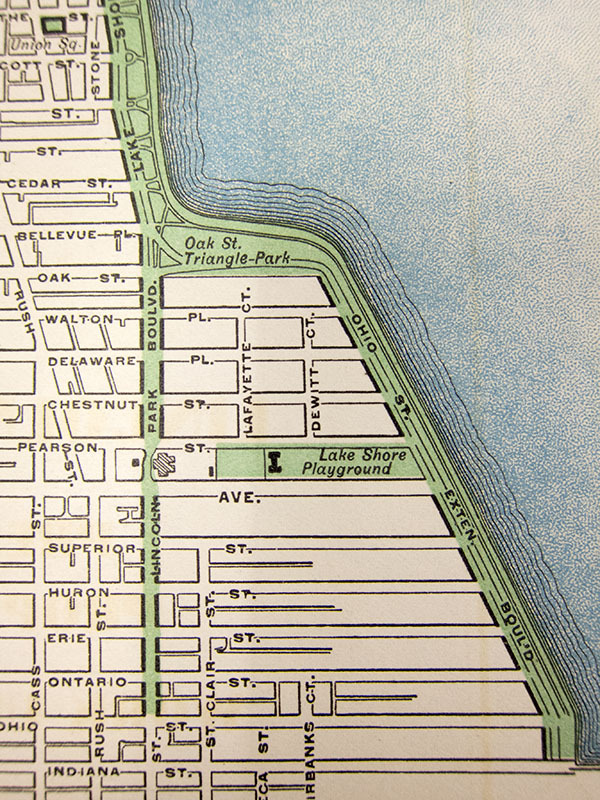 This detail from the 1908 Lincoln Park District map shows the Lake Shore Playground leading west from today's Lake Shore Drive to the edge of the Water Tower and Pumping Station complex. The small vertical rectangle represents the new Engine House 98 at 202 E. Chicago Avenue, and the vertical dumbbell shape at the site of the future armory and MCA is the park shelter. During this period Michigan Avenue was called Lincoln Park Boulevard and Lake Shore Drive was refered to as Ohio Street Extension Boulevard. Lafayette Ct. became Seneca Street and is now Mies Van Der Rohe Way. See more about the development of Lincoln Park and how it intersects with the city's first municipal cemetery at my Hidden Truths project website. At the time this map was published, the Lincoln Park Commissioners had just leased the city's land adjecent to the water works complex to incorporated it into the Lake Shore Playground. Within 7 years, they returned the ground to the city, who traded land with the federal government to place the First Cavalry Armory on the site. Part of the land west of the armory/MCA site became Seneca Park, part of the Chicago Park District. In 2004, the Museum of Contemporary Art ground was also recognized as part of the Chicago Park District, allowing the museum access to $2 million and the 10th museum in the city program. This detail of a 1907 survey shows the city property that the Lincoln Park Commissioners leased until the armory occupied the site in 1915. Lake Shore Park was planned for years before development began by the Lincoln Park Commission just before 1900. The Lincoln Park Commission was one of three Chicago park boards created by the Illinois state legislature in 1869. Twenty years later, the legislature gave a section of accumulating duneland north of Chicago Avenue to the park commission. The City of Chicago challenged the commission's ownership, but the matter was resolved in the commission's favor in 1895. Shortly thereafter, plans were drawn for what was initially known as Chicago Avenue Park. In 1897, the commission began stabilizing and expanding the site with landfill, a process that would continue for many years. Landscape improvements began in 1900. In 1907, the Lincoln Park Commission agreed to expand the park by improving city land just west of the park. At the time, the Lincoln Park Commission was a leader in a national movement toward neighborhood parks. The commission's efforts included Seward and Stanton parks, developed during the same period. In 1908, the commission officially named the expanded property Lake Shore Playground, in recognition of its location. A shelter house was erected, and outdoor recreational facilities installed. By 1915, the city had reclaimed its land, transferring it to the State of Illinois for an armory. The commission completely redesigned the remaining parkland in the following years. Demolishing the original shelter house, the commission constructed a new brick fieldhouse. The 1916 fieldhouse sat at the east end of the park, facing Lake Shore Drive and Lake Michigan. A running track, baseball diamond, and tennis courts stretched to the west. The Chicago Park District took control of Lake Shore Park in 1934, when the 22 city park districts were consolidated into a single unified district. In 1963, the park district dismantled the 1916 structure and built yet another fieldhouse on the park's eastern border. The armory to the west was demolished in the 1990s, and Lake Shore Park is now bordered by the stepped terraces of the new Museum of Contemporary Art, designed by Josef Paul Kleihues.